The final week of the regular season was a busy one for the wrestling team. On Jan. 22, half the squad traveled to Adairsville for a JV tournament; on Jan. 23, the Knights wrestled Wesleyan and Cambridge; and on Jan. 26, the team competed at the Darlington Classic. The Knights dominated the competition at Adairsville. Xavier Agostino was 4-0; Christian Bing and Sam Howe were both 3-0; Thomas Wells was 3-1; and Jude Black and Ben Schiffer were both 2-1. At Wesleyan, the Knights battled the home team to a 39-39 tie. The match was then decided on the sixth tiebreak criteria (most first points scored), and Wesleyan was named the winner. The match was not as close against 6A power Cambridge, and the Knights lost 24-55. George Blaha, Howe and Ahsan Hennings won all of their matches. Edward Blaha, Black and Charlie Warren each split and finished 1-1 on the night. Next up was the Darlington Classic, a competitive tournament featuring 17 teams. G. Blaha and Warren both wrestled well on the way to fourth-place finishes. Agostino and Howe had terrific showings, each winning three matches, all by pin, and finishing in the top six. Howe is now third on the team in varsity pins, with 13. E. Blaha had an exciting overtime victory against a tough opponent from LaFayette, and Grant LeRoux had a nice pin against his opponent from Coosa. Over the weekend, G. Blaha notched his 32nd victory, a new Pace Academy freshman wins record. Frank Houser '18 held the previous record of 29. This concludes the regular season for the Knights, but they will compete again on Saturday, Feb. 2, in the area tournament at Lumpkin County. The top four individuals per weight will advance to the section tournament the following weekend. The AquaKnights hosted Lovett, Holy Innocents', Mount Vernon and North Atlanta High School at the annual Last Chance Invitational meet on Jan. 26 and 27. 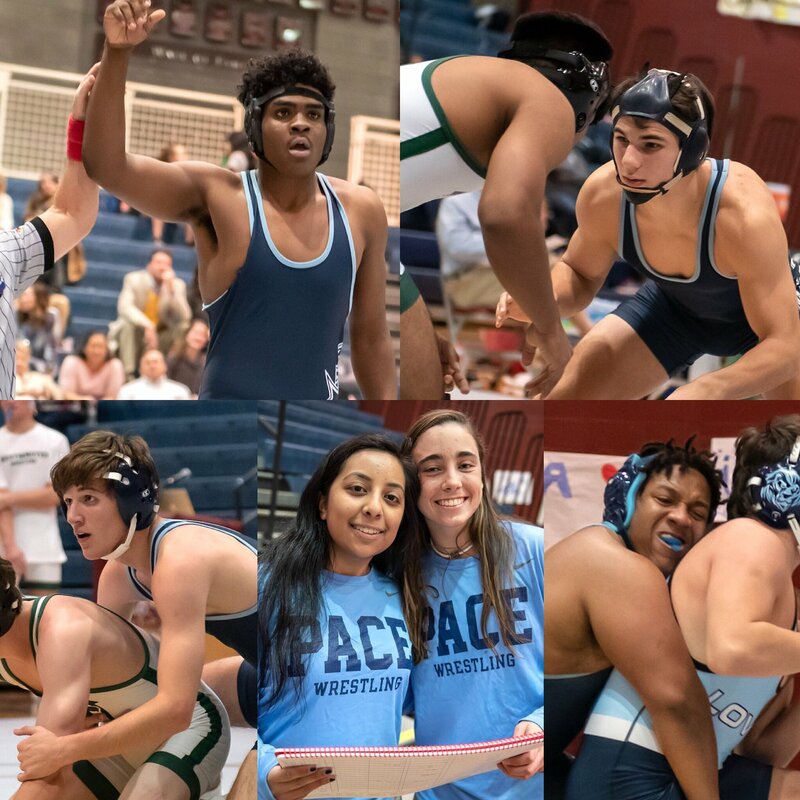 The Pace teams finished third out of the five teams, but came away with 45 personal-best times, five new state-qualifying times, and new school, pool and meet records. Sophomore Lizzy Kaye became the first Pace student-athlete to qualify for the state championship in both diving and swimming with state-qualifying times in both the 50 free and 100 backstroke. L. Kaye also set three new records in diving—including the Pace, pool and meet records—for 11 dives. Other new state-qualifying times were set by sophomore Amalie Little in both the 50 free and 100 free, and junior Jason Rosenbloum with his win in the 50 free. Senior Charlie Kaye lowered his state-qualifying times with wins in both the 200 free and 100 backstroke. C. Kaye came away with four new records, including pool and meet records in both the 200 free and the 100 back. This brings his total number of records to 19. 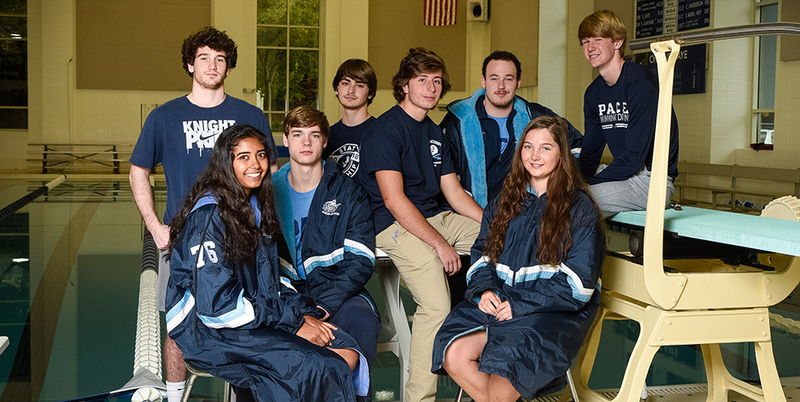 Please come cheer on the AquaKnights in the last regular-season meet on Thursday, January 31. The team will honor its seniors at Senior Night, which will begin at 4:30 p.m.
"This is the time of year when we want to be at our best," says varsity girls basketball coach Troy Baker. "With 38 steals in two games this week, we are doing what we do best—making it difficult for teams to score." After 10 region games, the Knights have allowed just 290 total points in region play. The Knights continued the trend on the road on Tuesday, Jan. 22, holding the Towers Titans to 4 points in the first quarter. Seniors Kayla Ross and Joelle Zelony combined for 14 of the Knights' 23 first-quarter points, and junior Jordan Upchurch caught fire in the second quarter, knocking down three 3-pointers. Ross and seniors Ann Rafeedie and Paige Fleming kept the scoreboard moving in the third, while sophomore Camryn Jones made her presence known hauling in 9 rebounds and 7 steals. Rafeedie and Ross led all scorers with 12 points each, and Zelony filled the stat sheet with 7 points, 4 assists, 8 rebounds and 2 steals. Upchurch finished with 9 points, and Fleming with 5. Junior Taylor Doucet hauled in 6 rebounds with 2 blocks. The final score was 55-16. The Knights' seniors didn't miss a beat against Westminster on Senior Night. Fleming came out firing, knocking down three of her game-high five 3-pointers in the first half. Ross and senior Madeline Janki created havoc at the top of the press, and Ross finished well in transition, scoring 9 of her 13 total points in the first half. Janki finished the night with 4 steals, and junior Virginia Hobbs commanded the paint with 10 rebounds while snatching 5 of the Knights' 20 total steals for the game. Upchurch was 3 for 6 on the night from deep, finishing with 9 points. Fleming led all scorers with 19 points, going 5 of 7 from 3-point range. The final score was 53-22. On this night, the team recognized and thanked the Class of 2019 (Fleming, Janki, Rafeedie, Ross and Zelony) for the tremendous impact they've had on the program throughout their careers. This week, the Knights, currently in first place going into the region tournament, will close out the regular season. They host Redan Wednesday, Jan. 30, at 5:30 p.m. and travel to neighborhood rival Lovett on Friday, Feb. 1, at 5:30 p.m. The Knights' first matchup with Lovett was a battle, and if ever there was a time to pack the house on the road, the girls will need your support this Friday at Lovett! On Saturday, Jan. 26, the varsity boys basketball team welcomed the Westminster Wildcats into a chaotic environment: Senior Night for the basketball program. Junior Reign Watkins led the team in two major categories, including scoring and assists. He finished the game with 17 points, 6 assists and 4 steals. Sophomore Madison Durr had a great night from the field, scoring 16 points and providing valuable consistency from the 3-point line, making two out of three attempts. Sophomore Justin Johnson also had a consistent night, shooting 100 percent from the field and swiping four steals. The Knights capitalized at a heightened rate by scoring 30 points off 21 Wildcats turnovers. When all was said and done, the Knights won the contest by a score of 54-44. 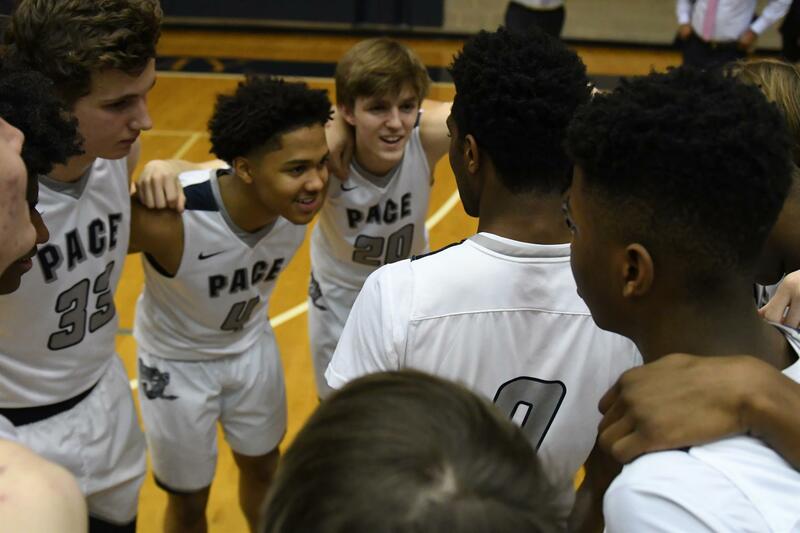 The Knights have two tough, final regular-season matchups against Redan on Wednesday, Jan. 30, at 7 p.m., then on the road against Lovett on Friday, Feb. 1, at 7 p.m.
Pace Academy is pleased to host the Region 5-AAA Basketball Tournament next week (Feb. 4-8). This will be a week full of exciting basketball, but will also require a lot of help to ensure a positive experience for all of our guests. On each day, we will open the Inman concession stand, as well as host a Hospitality Room (in the Inman Cafeteria) for visiting coaches, officials, etc. There are still many openings on our volunteer signup - please click this link (https://signup.com/client/invitation2/c38376342e7e17bd8cb65125833110c21f117670/2630912/false/#/invitation) and volunteer if you are able.